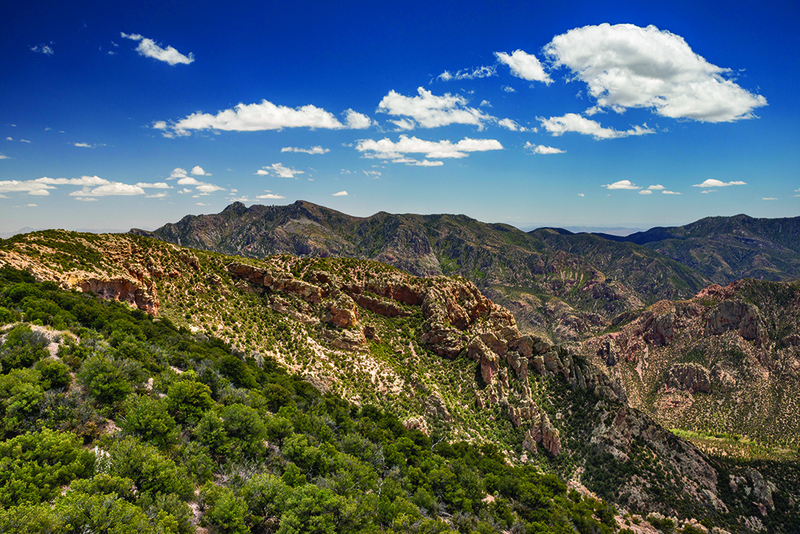 Southern Arizona’s Chiricahua Mountains sky islands, where the rare jaguar and ocelot have been spotted. Photo by Witold Skrypczak / Getty Images. Drive east from Phoenix and leave the interstate behind for the Beeline Highway. Turn toward Saguaro Lake — down in the bottomland of the Salt River, a scene emerges: wild horses whisking their tails in the shade on the sandy banks. About 100 horses of the Salt River herd still wander here, a short drive from the nation’s sixth-largest city. Amid the dust, they are a vestige of a vanishing American West. Elsewhere wild horses and burros not on the range before 1971 have been rounded up, sold or slaughtered. These European invaders can destroy native grasses and saplings, which form roosting areas for endangered birds. For years, the federal government has wanted to round them up, arguing these are just unwanted strays that have wandered through in recent decades; horse lovers have argued the herd has been around since the 1880s. Now, the state is resisting, and the whole matter seems to drag out in an extensive federal study. One option to rounding them up, euthanizing them or selling them is employing birth control, a tactic that has worked clear across the country on other horses. Wild or merely feral, the horses are an embodiment of the American West. Dozens of colorful, exotic and even endangered creatures are clinging to survival, sometimes with man’s help — and sometimes in spite of his resistance. These include squirrels isolated by the Ice Age, endangered jaguars and ocelots, and one of only two parrots native to the United States, the other already extinct. Passing through the Arizona mining town of Globe, U.S. 70 flat-hats across the San Carlos Apache Reservation. Near Safford, the green ribbon of the Gila River passes into view on the left as an imposing mountain range rises on the right: the Pinaleños Mountains. Head south, and the desert falls away. In just 35 miles, a traveler rises from palo verde and ocotillo to grassland and oak, overlooking the Gila River far below. Higher still, streams run and butterflies flit through meadows and quaking aspen. The trip up, to nearly 11,000 feet above sea level, is frequently likened to traveling from Mexico to Canada in 90 minutes. 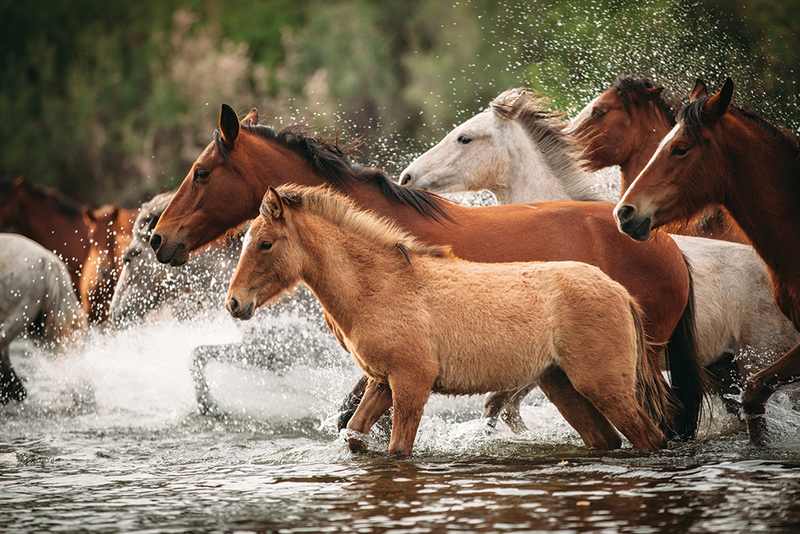 Just an hour from Phoenix, some 100 wild horses roam Arizona’s Salt River. Experts and activists debate whether this symbol of the American West should be protected or removed from the environmentally sensitive area. Photo by Jill Richards. Amid the maple and box elder are trees that were saplings when France’s Louis IX launched the Eighth Crusade in the 13th century. In these cool woods dwells a tiny mammal thought to have vanished 60 years ago. One of a couple of dozen subspecies of the common red squirrel, this one has a peculiar backstory — as well as an uncertain future. Tamiasciurus hudsonicus grahamensis lost contact with its cousins as the last Pleistocene Ice Age ended 12,000 years ago. Isolated, the Mount Graham red squirrel did not learn the vocal skills of its kind. Even today it is generally silent, only making a high-pitched trill when frightened. Weighing about 8 ounces and standing about 8 inches tall, the squirrel was hunted for meat and rendered homeless as the mountain slopes were logged bare. In the 1920s, the squirrel faced a new threat: another squirrel species introduced — by people — drove the native up the mountain. By the 1950s, the native was believed extinct. Then in the 1970s, a couple of dozen were discovered atop Mount Graham, the peak of the Pinaleños. By then, the University of Arizona was set to build a colossal observatory. Two things stood in the way: the Apache people, who considered the mountain — which they called Dzile Nchaa Si’An — sacred, and the little squirrel. The rodent made the more persuasive argument; it was declared endangered in 1987, and 10,000 acres were set aside for it. It turned out, though, that the squirrel liked the lower reaches of fir and pine, too, according to a University of Arizona study. The population peaked at about 600 in the 1990s, and more squirrels were encountered down the mountain. However, now the population has tumbled to under 300, according to the state, and scientists are weighing studying further, setting aside still more land or introducing captive squirrels. More than mountains, the Pinaleños form the gateway to a series of sky islands — namely the Madrean Sky Islands of Arizona, New Mexico, Chihuahua and Sonora. One of 40 such nearly self-contained ecosystems in the world, these mountains formed 13 million years ago as the desert floor fell. Mantled by snow in winter and wreathed by clouds much of the time, they contain a third of America’s bird species and half the mammal species. About 100 miles southeast, the road over the Chiricahua Mountains is closed in winter. This is where the Madrean Sky Islands got their name. In 1943, Arizona writer Natt N. Dodge likened the Chiricahua to a “mountain island in a desert sea.” In 1967, Wildon Heald published the book Sky Island, describing the ride through elevations and ecosystems from his home in Rodeo, New Mexico. In recent years, these mountains have seen the return of two nearly mythical cats: the jaguar and the ocelot. Until recently, it was thought that the last female jaguar in the United States was killed in Arizona in September 1963. Yet, since 1996, five of these apex predators, common to the rain forests of Latin America, have been photographed in Arizona. The latest, nicknamed El Jefe (or “The Boss”) isn’t shy about making himself known. He has tripped automatic trail cameras hundreds of times. Side by side, a male jaguar weighs about the same as a mountain lion, between 110 and 210 pounds. Cougars opportunistically devour small game while jaguars rely on big game for over 80 percent of their diet, according to studies. And while the mountain lion has been known to withstand up to 12 attacking wolves, the jaguar exerts the most powerful, bone-crushing bite of any mammal in the world. Their sightings have prompted the U.S. Fish and Wildlife Service to try to declare 838,000 acres of sky islands protected habitat for the endangered spotted cat. However, the state of Arizona has argued that so few jaguars have been sighted that any conservation efforts should be limited farther south in their range: Mexico. The same automatic trail cameras installed by the University of Arizona have also captured three ocelots in a single year. About twice the size of the average house cat, the spotted cat is also usually found in Latin American rain forests. But they do range into the Sierra Madre in Mexico. In Arizona, they have been found sitting on the front steps of a mine and napping in the boughs of a tree. Protected by the Endangered Species Act, they are also now the subject of a federal lawsuit, as environmentalists ask a judge to block the use of lethal — and common — traps for bobcats, which the plaintiffs say can incidentally ensnare the ocelot. Wetmore counted 1,700 birds in Cochise Canyon. But logging and hunting to the point of eradication meant the last big flock was seen here in 1938. Of all the creatures of the sky islands, the parrot is clearly the one that may have already lost its fight. It was listed as endangered in 1973, and efforts to introduce captive birds in the Chiricahua failed. The federal government gave up in the 1990s. Today, practically none exist in the United States and just 2,500 survive in Mexico. So far, the efforts of another Rodeo, New Mexico, man, Chris Biro, have not met with the success of Wildon Heald. The government blocked his attempts to introduce captive parrots into the wild. The last bird sighted flew far from home, across northern New Mexico, over a decade ago; not another has been seen since. Chelsea Verstegen contributed to this article.